Few North Carolina place names are older than Lockwood Folly, and the origins of few place names are more mysterious. It appears to have made its debut as “Look Wood Folly” on the c1673 Ogilby-Moxon map, A New Discription of Carolina..., the so-called First Lords Proprietors’ map. “Lockwoods Folly” is seen on the c1673-75 A New Map of the English Plantations in America…, by Robert Morden and William Berry, and “Lockwood Folley” is found on the 1682 Gascoyne map of Carolina, the so-called Second Lords Proprietors’ map. 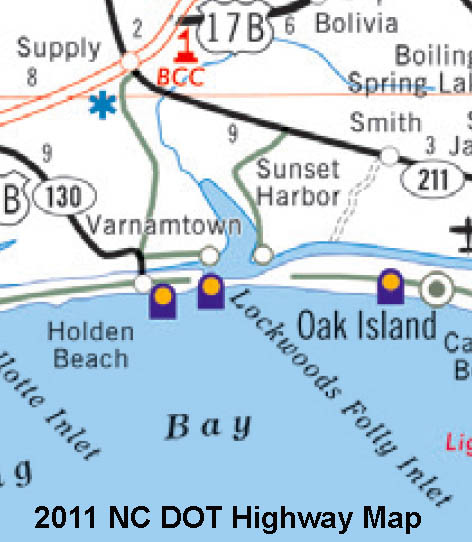 Lockwood Folly remains a regular, if not constant, place name on North Carolina maps from that point forward to current times. Whence came this unusual name? One story relates how a Mr. Lockwood built a boat on the river that currently bears his name. He constructed the boat with a draft that was acceptable for the depth of the river and the ocean. Unfortunately, the boat’s draft was too deep to clear the inlet, so Lockwood left it in the inlet to rot. Locals thus referred to it as Lockwood’s folly. Thus far, I have not located any factual historical basis for this story. Another explanation relates how a Mr. Lockwood tried to establish a settlement at this site, but he either provided inadequate provisions for the endeavor, or ran afoul of the local native Americans, resulting in a failed settlement, the Lockwood Folly. This explanation dates back at least to 1734, according to a traveler’s diary published in the Georgia Historical Papers, Vol. II, page 54, quoted by James Sprunt in his Chronicles of the Cape Fear River, 1660-1916. Yet another explanation with some historical basis, dating to January 1778, is found in the travel journal of Ebenezer Hazard, edited by Hugh Buckner Johnston and published in the North Carolina Historical Review Vol. 36 (1959), 358-381. Hazard wrote, “Lockwood’s Folly is a Creek which empties into the Sea: it gets its Name from one Lockwood who mistook it for Cape Fear Inlet, & lost his Vessel.” That sounds plausible, even though it appears 40+ years after the “failed settlement” explanation, and more than 100 years after the name first appeared on a map. In The North Carolina Gazetteer, author William Powell provides a fourth, and reasonably plausible derivation: “…in the seventeenth century, however, the word Folly was used in the sense of the French folie, ‘delight’, or ‘favorite abode’, and it formed a part of the name of English estates. Lockwoods Folly River… has been described as the second most beautiful river in North Carolina, and it may have been the ‘delight’ or ‘favorite abode’ of an early settler named Lockwood.” If anyone can find evidence that Lockwood settled in this region, please inform everyone via the Leave a Reply option below the comments. Whether a failed settlement or a “delight”, the origin of Lockwood Folly obviously predates the c1673 Ogilby-Moxon map. Therefore, one could reasonably assume that Lockwood was a member of one of Hilton’s exploration parties, either 1662 or late 1663, or a part of the aborted settlement of the Cape Fear region by New Englanders and Barbadians in the mid 1660s. The 1734 traveler’s account mentioned above described Lockwood as a “Barbadian”, but Hilton’s account of his voyage from Barbados in 1663 does not mention Lockwood or any attempted settlements. If anyone has further information, please share it with us via the comment section. A Relation of a Discovery Lately Made on the Coast of Florida by William Hilton, published in London in 1664, as reprinted in James Forte; a 17th century settlement… by Cornelius M. Dickinson Thomas (1959). Chronicles of the Cape Fear River, 1660-1916, 2nd edition, by James Sprunt (1916). This entry was posted in 16 & 17th Century, General or Reference, What's in a name? and tagged cape fear, lockwood folly, william hilton by crmaps. Bookmark the permalink. Lockwood’s Folly is possibly named for ship captain Nicholas Lockwood. Nicholas Lockwood was the nephew of Henry Weston, gent., who made his will in Barbados on November 11, 1674. Nicholas Lockwood was captain of the Mary, on which Thomas Drayton, Junr. (founder of Magnolia Plantation on the Ashley River) arrived in Carolina in 1679 (ticket granted at Barbados on April 25). Lockwood had also brought immigrants from Barbados to Carolina on this ship a year previously. This book lists trips to Carolina by Nicholas Lockwood in 1678 and 1679 which you referenced above. Still looking for something placing Lockwood in the area in 1660s or no later than 1672 that would have been the source of “Look Wood Folly” on the c1673 Ogilby-Moxon map. Thanks so much to John Collins for alerting me to Ebenezer Hazard’s travel account of January 1778 that provides yet another explanation for the origin of the Lockwood Folly name (incorporated into the blog post above). Now that past issues of the NC Historical Review are available on line, many web searches need to be repeated to find information like this.